The 17th of March was St. Patrick's Day in Canada, and like the previous year, I wore green without intentionally doing so (and I'm usually with something in purple). As a Baha'i, I don't drink alcohol, so St. Patty's Day didn't have any big significance to me (everybody goes wild with the alcohol), so I was not even aware that the day had arrived. I was enjoying the sunshine (yes, we finally have sunshine!) when I caught sight of a poster on campus that announced that the proceeds of beer-sales, for a certain period would go towards Epilepsy Day, which falls on March 26. 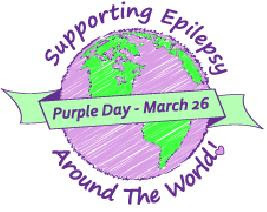 Just as people all seem to wear green on St. Patty's, the poster encouraged everyone to buy a beer and contribute towards the Epilepsy-Awareness Campaign, and wear Purple in support. wicked idea! Ill buy a beer for this cost! Great stuff....good to give support.